"The application allows you to synchronise your Tasks list with Exchange Server 2007 and later so you can add and update your tasks on the go and always remain in-sync with your Exchange mailbox. It uses the same ActiveSync protocol as the built-in Email and Calendar applications to efficiently and securely synchronise directly with your server over any network type." A trial version allows entry of up to 4 tasks so that you can get a feel for the application. 2. Lower price. I hate saying this, as I am sure that the dev worked hard on it...but in the day and age of .99 cent apps, a small "utility" like this should not be 3.99. I love seeing all the new stuff in the Marketplace! Now, if only Windows Live supported tasks. I just installed it and it seems to work as expected. 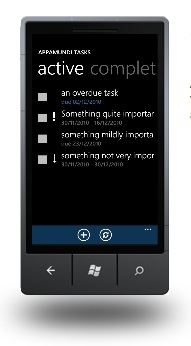 A big problem, not related to the app itself, is that WP7 does not support categories. Besides I strongly believe that it is preposterous that in order to use "Tasks" in WP 7 people need to buy a third party application; this functionality has been supported since the beginning of Windows Mobile OSes. For as long as I can remember this has always been one of the top complaints about Windows Mobile/Phone. There are always 3rd party apps that manage Tasks and they are always a decent selling item. So why is MS so blind to this? What is so hard to understand that non-Exchange users use Tasks?! I'd much rather see the Live service support Tasks so that a simple sync from home (Outlook Connector) updates everything as it does today. Email, Contacts, Calendar, and Tasks! MS removed Drive Extender from WHS, the key selling point of WHS. Microsoft doesnt get it, any of it. I am not sure that the issue is that they do not understand rather than the internal battle for importance and dominance among department inside the company. While the idea to make them competing against one another makes sense.... in theory, if the competition is not "controlled" by the upper management it degenerates and harm the overall company performances. And yes, WHS is a perfect example of the issue. Last edited by Fritzly; 12-13-2010 at 09:03 PM..
WHS has long been on my watch list for repurposing a PC that will be upgraded next year, but with the Drive Extender leaving the product it is no longer on the list. WHS was a cheap and easy solution (as I viewed it), now it looks like I need a RAID card and have to setup some complex config where Drive Extender simplified it drastically. Maybe some execs needs to get out and meet customers in person to learn more about their direction and how frustrating it is from the outside. I grabbed this as soon as I saw it on the Marketplace. Unfortunately, my co. is still running Exchange 2003 ! ..when I checked with my CIO they said "We're looking into it..." sheesh.. talk about being WAYYYY behind the times. That said, I will add my voice to those who don't understand why HTC (first, in their implementation of Sense) then MS decided Tasks were not something Outlook people needed to synch/manage. I depend on them to keep my life in some assemblance of order. My favourite rant: Why are there no tasks in modern smartphones? Palm (the one everyone laughed about) got that right with the Palmpilot all those years ago. Do people not use tasks? Seriously!